You are here: Home / Increase IP value / When everything becomes software, how does that affect IP strategy? Marc Andreessen, co-founder of Netscape and currently co-founder and general partner of the venture capital firm Andreessen-Horowitz, wrote in August 2011 in the Wall Street Journal about how “Software is eating the world”. While Mr Andreessen was building on earlier observations, such as the author of this article, that software is the “viral” industry, as it infects all other industries, he did provide some focus onto a very important phenomenon. This phenomenon is the fast growing importance of software in pretty much any industry or human activity. This reflects is the practical side of the fact that we are converting (updating?) into a digital world. This is a profound change, with many consequences. One consequence is that the software invasion is not limited to the way products function or are sold. While it is true that a phone is no longer a phone, but a very powerful small computer with a basic personal conversation application, just like a car is turning into a very powerful large computer with a basic personal transportation application (an App that will automate soon), the presence and impact of software is much more pervasive than that. All other aspects of business, and society, tend to become computerized. From supply chain management to enterprise resource planning, from marketing to HR, from legal to sales(force.com), all aspects of activity become computerized, and the relative importance of software in all of those aspects is growing. A second consequence is that the growth of the digital part of an activity inevitably outpaces the growth of the non-software part. This is caused partly by Moore’s law, but also by the fact that software is not called “information technology” for nothing. Information tends to multiply, and increase its productivity, much faster than hardware. The graph gives a pretty good illustration of what happens when software enters into an activity or product. 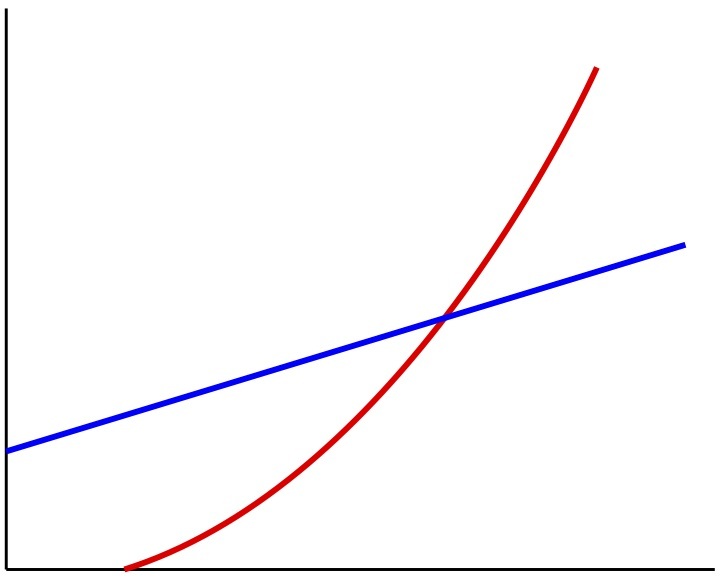 The red line represents growth in software added value, the blue line in hardware added value. The relative importance of software tends to grow at exponential or semi-exponential rates, while the non-software parts grow at a more linear rate. Inevitably, the software becomes the most valuable and important part of the product, service or activity. And this has some profound consequences on the way businesses define their IP strategy. Why is this relevant to IP strategies? There are two reasons why the viral effect of software is very relevant to all IP strategies. The first reason is related to the business models that apply to software. Software is brought to market through business models that are different from those used for hardware or services. One of the important differences is that software is not sold, but licensed. While the license can be bundled with other aspects of business, such as services (maintenance, support, implementation, etc), and those services will often play an essential part in building the business, the license is always a core part of any software business model. And the great advantage of licenses is their flexibility and versatility. Software licenses range from extremely closed to extremely open. Rights of licensees can be very wide, or very limited. There are relatively few legal limitations on how you can license software. And this, in turn, offers great potential to structure, adapt and modify business models in new and different ways. In practice, it means that, as the relative importance of software in a business offering is growing, such a business acquires more flexibility to modify and fine-tune its business model and strategy. The second reason is that software is one of the few technologies where both patents and copyrights apply. Copyright applies to the code in which software is written. But copyright only protects against copying the particular code of a piece of software, it offers no protection to the functionality expressed through that code. On the other hand, it is possible to patent certain functionalities of software. Even though the conditions of patentability vary between the major jurisdictions, the principle remains the same: patents will apply to a function of the software, regardless of the code that expresses that function. This means that the viral effect of software, once it has “contaminated” a business, and software becomes an important part of the value proposition of such business, has as a practical effect that it will add complexity and variability to IP strategies, because more IP rights will apply to a much wider range of possible business models. When we look at how software businesses deal with IP rights, we notice that, until relatively recently, “technical” IP rights, by which I mean patents and copyrights (but not trademarks) did not have a very strong influence on either technological development or business models around software. There is in reality very little software that gets patented, and, while copyright is a key element in determining the licenses under which software is sold, there is actually very little use of copyright in its “classical” way, which is to prevent competitors from using your copyright. It is only since software has invaded the market of mobile telephony that we start to see a lot of patent litigation and enforcement around this technology – and this raised awareness of IP is related to the technical interaction between the software and the hardware, rather than the software itself. The reason why IP rights are in general weak in software is related to the specific characteristics of software, which operates at three levels – and IP rights don’t deal with those levels in the same way. The three levels at which software operates are technology, functionality and content. Technology is the level where we may find patents: technology is the underlying core of software, and the level at which software interacts with hardware. But, as said, while some aspects of this level are patentable, and do get patented, a lot of innovation of software at this level does not benefit from a strong protection IP strategy. This relates e.g. to software languages, middleware, operating systems and similar technologies. The reason why IP rights don’t work very well at this level is because their success is dependent on their open character. Think of the original story of Microsoft, who beat Apple back in the 80s and 90s, because Microsoft’s technical standards were open, and anyone could (and did) program for Windows, whereas Apple kept everything closed, and was almost pushed into irrelevance. This story is repeated in the success of the Apple App store in the beginning of the 21st century: only because the development kit is effectively completely open, was Apple able to get developers to bring out those millions of Apps with their billions of downloads. In other words, the more you close the system (for which you could potentially use patents), the less success you will have in the market. At the level of functionality, the story is worse. Not only is it much harder to patent “pure” software functionality, it is also much more useless. This is caused by the relative flexibility and ease with which such functionality can be created – the arms race is heavily tilted against patenting functionality. And copyright, as we know, does not protect functionality. Finally, as far as content is concerned, while copyright applies, it will not come as a great shock to hear that Information Technology enables free copying, from a technical perspective, much easier than its opposite, the rather ineffectual DRM or digital rights management. This is, in turn, re-inforced by the advent of user generated content, a tendency that blurs the line between function and content, and that turns every consumer of content into a producer of more, derivative content. This is a phenomenon that current IP rights have no valid answer to – and so they risk being ignored, which is exactly what we start to see with phenomena like Pinterest, but even Twitter and Facebook. Moreover, the speed of innovation in software is staggering. 50% of all software used today is less than three years old. That means that the turnover rate of technology is so fast, that the classical approach of IP rights, aimed at recovering over longer periods of time the initial investment in technology, has not sufficient time to take root. So we see how “classical” IP rights are significantly weaker and less relevant in the software world, because of the characteristics of software. Open Source uses IP rights, for a purpose that aims specifically at preventing IP rights to apply. The copyleft, viral, licenses such as the GPL (the GNU General Public License http://www.gnu.org/licenses/gpl.html) , effectively prevent the normal operation of IP rights, where an exclusive right holder will be enabled to enforce the protections offered by IP rights to demand a premium or rent for the right to use the technology developed. This is done through enforcement of the copyright license, which obliges the licensee to respect the four freedoms of Open Source, which include the freedom to run on any technology, and modify the software – approaches that are anathema to classic IP strategies. And Open Source is no longer a marginal phenomenon, it is quickly becoming mainstream. Current estimates are that more than one third of all code written in 2011 was written in Open Source code. Open Source proponents claim that 75% of all enterprise software contains Open Source elements, and predict that this number will rise to 99% by 2016. In most markets where Open Source enters and acquires critical mass, proprietary software providers tend to get pushed out of the market, or become marginal players themselves, surviving only through a focus on niche markets or niche functionality. This is caused by the fact that most users, and certainly B2B users, find that Open Source software tends to be better, more innovative, more secure and more stable than their rival proprietary products. Time-to-market is significantly faster for Open Source software, step-in costs are lower, and vendor lock-in issues are much easier to handle. Moreover, any industry dealing with open standards will have a tendency to go to Open Source. It is no coincidence e.g. that, as the car manufacturing industry wants to continue to cut costs and ensure interoperability between its different providers, OEM or otherwise, up the value chain, it is moving into the Open Source direction. This will have an important impact on how IP rights are used. To put it as a caricature: if everything becomes software, and all software becomes Open Source, are IP rights doomed? I don’t think IP rights are doomed. What will have to change, though is how we use IP rights, and how we define what an IP strategy is. Historically, an IP strategy is about protecting investment in innovation and technology. With the advent of software, and the rising importance of Open Source, that will have to change in a number of ways. The first change is that the question on use of IP rights in the business model will become more complex and more sophisticated, both in terms of more IP rights that apply, and a much wider variety of business models available. The second, and most fundamental, change is how IP rights will be used. IP rights will no longer be used to simply “protect” innovation, they will become an essential tool that determines how innovation is brought to the market. Just like Open Source uses copyright (an IP right) to enforce its anti-IP philosophy, so will any business and IP strategy have to look at the way it can use IP rights as an essential part of the structure of the business model, supporting the ultimate goals of the business. Another important consequence will be the relative decline of the importance of “technical” IP rights, such as patents and copyrights, versus the growing importance of trademarks, designs and logos. These are IP rights that are not based on technical or creative innovation, but on identifying and distinguishing a product or service from its competitors. As the protective aspect of technical IP rights becomes less relevant, the importance of identity IP rights, and branding in general, will increase. This is because businesses will coalesce their technical skills around the value of their brand and trademarks, rather than through the possibility to block technical copying by competitors. A good example of this trend is Red Hat, the first $1bn Open Source provider. Their license to Linux or other Open Source products is based on a combination of services, specific customization, technical support and the use of the Red Hat logo and brand. For a lot of Red Hat products, the source code is available but you have to invest time and money to get it, and potentially approve it. Why not spend that money on the reassurance of a skilled provider who will help you solve your problems? After all, for a lot of products, customers find that the question “does it work” matters a lot more than “who owns the IP”? Other IP rights may struggle. It seems difficult to see how Trade Secrets can remain very relevant when the amount of data produced by humanity (including its computers) continues to explode at a rate of a 100% increase every 18 months, and where every second year can claim to have produced more data than in the entire history of mankind until the end of the previous year. The problem is not so much that we will forget how important Trade Secrets are, it is just that the relative cost of keeping something secret will become prohibitive when all the other information drops 50% in cost every 18 months. It is another example of the immense creative destruction power of the combined exponential increases in computing power, communication capability and data storage. What that means is that IP strategies will no longer be able to focus simply on the “protection” side of IP rights, but will have to work with the structural, constructive side of IP rights, enabling businesses to better understand what their unique value-add is, and then structure IP rights around that value-add, and bringing it to the market in the most efficient way for that business. And the balance between those different IP rights will become, even more than today, a key consideration in any business strategy. In other words, IP strategies become, much more than today, a key part of the heart of the business model itself.